Founder of Purity, Rob Quinn looks at the importance for brands of ensuring their customer and brand experience strategies take the UK’s ageing population into account. My parents are in their early to mid-70’s, they eat out regularly, often several times a week and travel abroad three to four times per year. They use loyalty cards at Waitrose, John Lewis and Tesco, amongst others. As consumers they own an iPad, Alexa Dot, Kindle and a laptop, whilst both own a smartphone. They are brand loyal, to a point although are susceptible to a price promotion from time to time – it’s fair to say, “they love a deal”. They lament the demise of retail banking and refuse to use online banking. Despite both having smartphones, they often have them switched off and object to having to call mobile phones from their home landline due to cost. Until recently they were BT Sport subscribers until the process of broadband and TV options became both costly and complicated. In spite of their regular breaks overseas they will only use budget airlines as a last resort and refuse to pay for allocated seats, being prepared to not even sit together on flights if this means not giving any additional revenue to the likes of Ryanair. They both refuse to use the self-scan in supermarkets, preferring a checkout operative do this for them. However, they both vote with their feet and their wallet. It’s considered almost a cardinal sin for any retailer, restaurateur, bank, airline, hotel, or call centre (take note British Gas), to give them poor customer service. Views are aired publicly in their various social circles and this word of mouth no doubt carries influence amongst their peers who I can imagine shake their heads in collective disappointment in the decline of standards in the UK. My parents along with their friends and acquaintances represent an increasingly influential section of the British population. 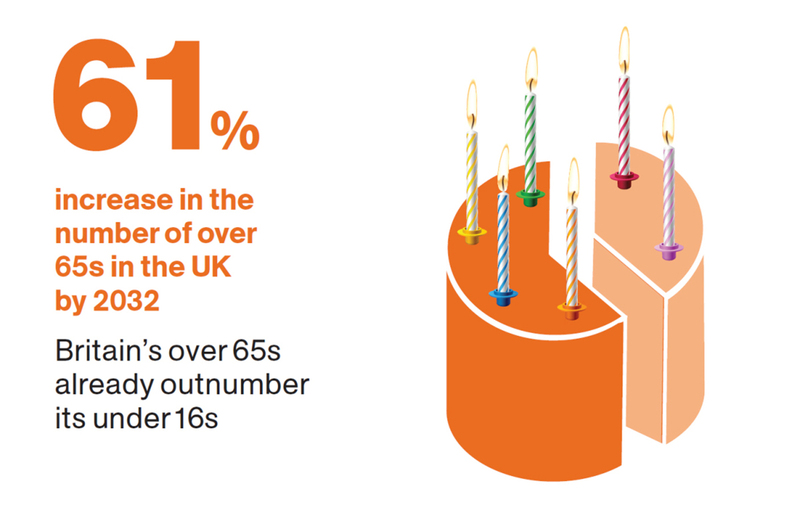 According to the ONS (Office for National Statistics), in the UK those aged 65+ now out-number those aged under 16 and totals in excess of 10 million, with this number expected to double by 2035[i]. In some, but not all cases, it can be argued that this demographic is both cash-rich and time-rich. A forecast by Nielsen[ii] predicts that by 2020 global spending by households headed by over-60s could amount to $15tn, twice as much as in 2010. It is a section of the population that brands who fail to acknowledge and accommodate, threaten to alienate and lose as valuable customers. When sitting in agency brainstorms responding briefs and devising strategic and creative solutions we often see brands seeking to attract urbanised, metropolitan 18-34 year olds. It appears to be increasingly rare to consider those people who are aged 65+ and yet, the figures tell us that this group of the population are in a position to carry commercial influence with brands. At Purity we already work with and represent a number of brands who could consider the age and demographic of their consumers to be something of a broad church, Samsung and BMW being just two examples. It is therefore beholden on us as an experiential agency to advise and consult our clients on how best to create and deliver campaigns that can be personalised where necessary and ensure that we not only acknowledge more mature consumers but seek to embrace them and ensure that their influence and spending power sits with our clients. Design & Environment – ensure that the design and aesthetics of any experiential environment are open and welcoming. Boundaries shouldn’t be intimidating in anyway or present a barrier to entry. Think about how consumers are welcomed on arrival and what the consumer journey looks like. Staff selection & training – As much as possible consider the profile of staff recruited and ensure these complement those consumers you expect to be interacting with. Staff should be trained to ensure that communication with consumers is personalised and tailored according to the consumer. Messaging shouldn’t be scripted, questions mustn’t be closed and most importantly listening to the comments or questions of consumers is vital. Train staff to demonstrate empathy and understanding when engaging with consumers and most definitely do not patronise through use of language. Use of technology – a report by Havas[i] reveals that within this age group online activity now accounts for 67% vs 14% in 2000, they own a smartphone (42% vs 18% in 2013) and they use social media (34% vs 27% in 2013). Brands and agencies need to be mindful that consumers aged 65+ are increasingly using or interested in using technology within their experiential solutions. Where promoting consumer or technology brands consider how best to educate and inform consumers through memorable interactions. Customer experience – if my own anecdotes are anything to go by, then customer experience is as vital for the 65+ age group as it is for any consumers. Welcome, question, listen, and respond. Engage with these consumers and seek to truly understand their wants and needs. The Customer Experience Programme that we have developed at Purity seeks to take all this into account with the desired output being to wow consumers in every facet.